Image caption One of the main backers of the monument said that it "honoured the historical moral foundation of the law"
A new monument in the US state of Arkansas listing the Ten Commandments has been destroyed less than 24 hours after it was unveiled. The 6ft (1.8m) granite slab was erected in the grounds of the state capitol. A suspect is reported to have driven his car into the structure early on Wednesday while filming on his mobile phone and posting footage on Facebook. Michael Tate Reed is now accused of defacing an object of public interest and criminal trespassing. He is also accused of first-degree criminal mischief. A Facebook Live video by an account under the name of Michael Reed shows what appears to be a driver pointing his headlights towards the monument and shouting "Freedom!" as he moves toward it. 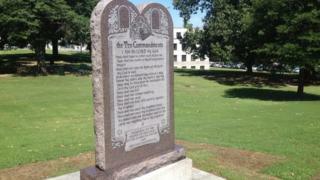 Mr Reed was accused of destroying a different Ten Commandments monument in Oklahoma three years ago, media reports say. He was diagnosed with a schizo-affective disorder (a mental health condition) after that incident but was released from hospital in January 2015 as part of an agreement with the Oklahoma County district attorney's office in which he pledged to continue receiving treatment and therapy, Tulsa World reported at the time. Former Arkansas Governor Mike Huckabee tweeted that "some idiot in my home state broke all 10 commandments at the same time. He wasn't Moses and it wasn't Mt Sinai". The initiative to build the statue was led by Arkansas Senator Jason Rapert, who sponsored a 2015 law to display it on state grounds. Mr Rapert said it "honoured the historical moral foundation of the law". But opponents including the American Civil Liberties Union said that its appearance amounted to "an unconstitutional endorsement of religion" - they threatened to take legal action to have it taken down. The statue was financed by more than $26,000 in private donations, local media reported.